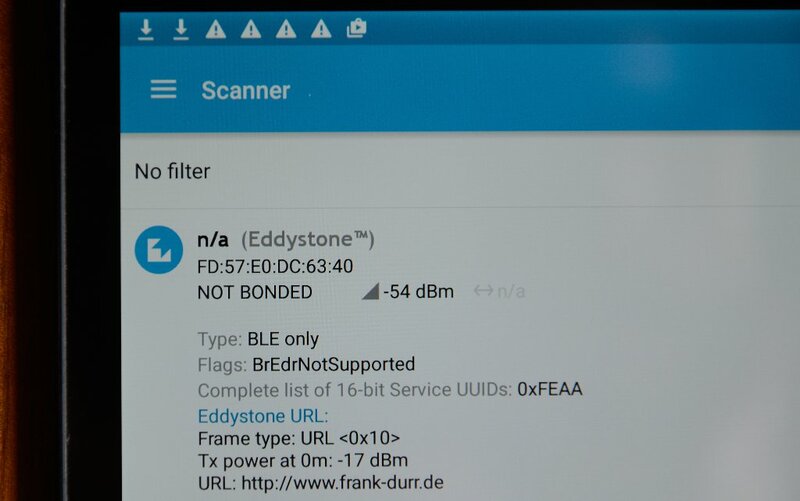 Today I want to introduce Faros, an open-source Bluetooth Low Energy (BLE) beacon supporting Google’s open beacon format Eddystone implemented for the popular Arduino platform. UID frames broadcasting identifiers, namely a namespace identifier to group a set of beacons, and an instance identifier to identify an individual beacon. URL frames broadcasting a short URL, so you can think of this as a radio-based QR code replacement. Telemetry (TLM) frames to check the health status of beacons. 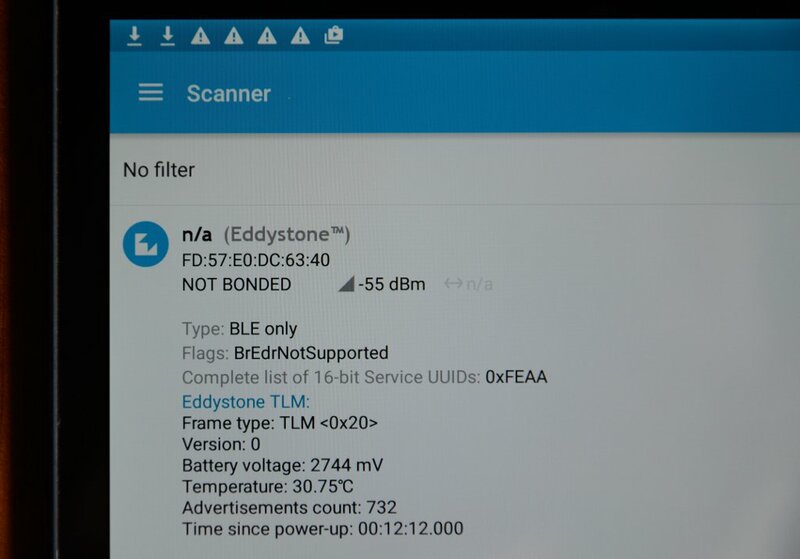 These frames contain the beacon temperature, battery level, uptime, and counters for broadcasted frames to facilitate the management of beacons. The complete protocol specification is online, so I do not go into much technical detail here. Faros software running on a commodity Arduino Pro Micro, powered and programmed through the USB connector. This could also be easily setup on a breadboard. 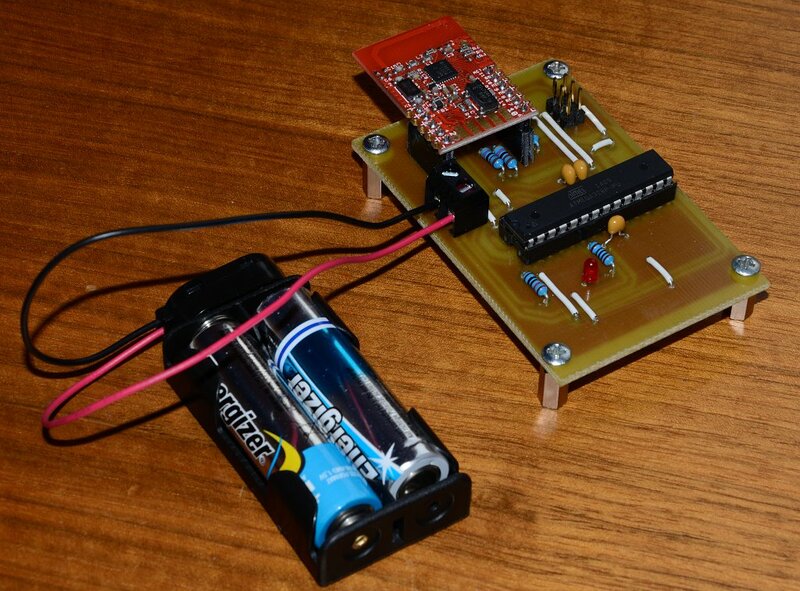 Self-made Faros printed circuit board (50 mm x 70 mm) with an ATmega328P powered by two AA-size batteries. 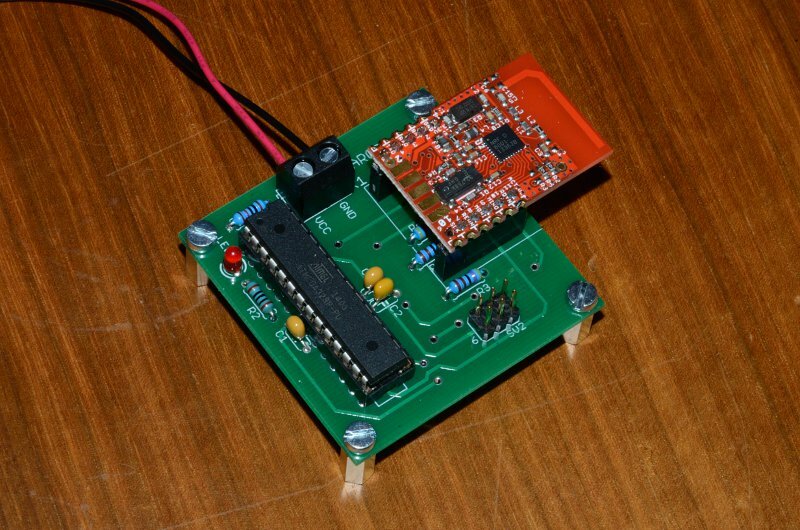 A PDF with the PCB mask is included in the Git repository. Faros printed circuit board (50 mm x 50 mm) manufactured by Seeed Studio using an ATmega328P. 10 PCBs cost about 15 $ including shipping. Gerber files are included in the Git repository. The Faros board further lowers cost and energy consumption—two very important requirements for field deployments. The Faros board just needs the BLE module and an ATmega328P (where the “P” stands for pico-power). It is programmed via ISP so you do not need USB. The ATmega is put into power-down mode whenever possible, and then consumes only few micro-ampere. 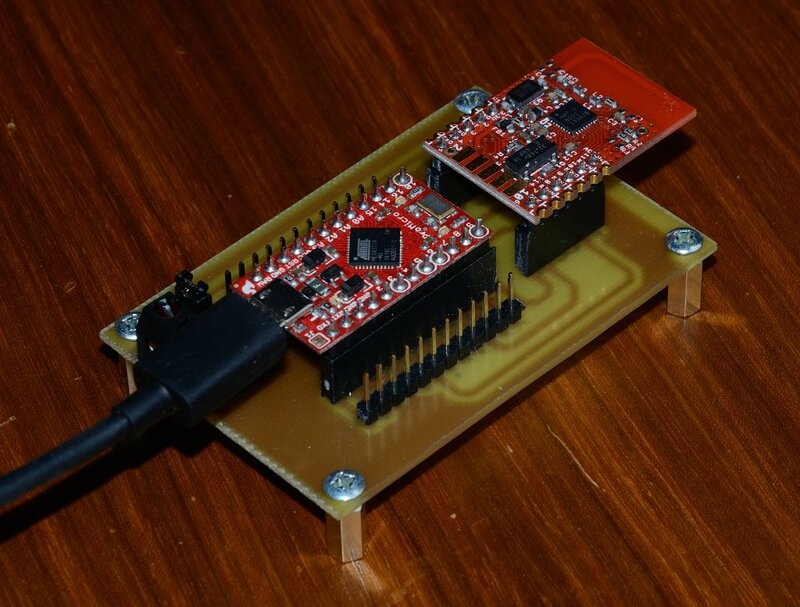 The nRF8001 will wake up the ATmega whenever it has an event to transmit. Moreover, the watch dog timer wakes up the ATmega periodically to switch the Eddystone frame types. Thus, the beacon can send all three frame types sequentially in a round robin fashion. that is well-suited for self-etching; (2) a double-sided 50 mm x 50 mm layout that can be sent to a PCB manufacturer. The Faros board also has a 3 mm low-current LED, which can be switched on by a digital pin of the Arduino. It draws 10 mA at 3 V, which is a lot if one targets runtimes of several years! So if you aim at maximum battery lifetime, only send short pulses in long intervals (e.g., one 100 ms pulse every 30 s amounts to about 33 uA average current), or even better: rely on TLM frames (management is their job anyway). Of course, the Faros board can be run from batteries. The nRF8001 can run down to 1.9 V; the ATmega down to 1.8 V at frequencies <= 4 MHz. The maximum voltage for the nRF8001 is 3.6 V. Thus, one good option is to use two AA- or two AAA-size alkaline batteries. They are cheap. They provide > 1800 mAh, which should suffice for several years of runtime. Two batteries are discharged at about 2.0 V (then the voltage drops rapidly), which fits nicely our desired voltage range of 1.9 – 3.0 V. And at runtimes of several years, no re-charging is required (you rather replace the device than changing the batteries). Of course, you can also try out other options like coin cells (e.g., one CR 2450 @ 3.0 V, 560 mAh), or one battery (1.5 V) plus a step-up converter (which wastes maybe more than 20 % energy for conversion and is probably more expensive than a second AA or AAA battery). 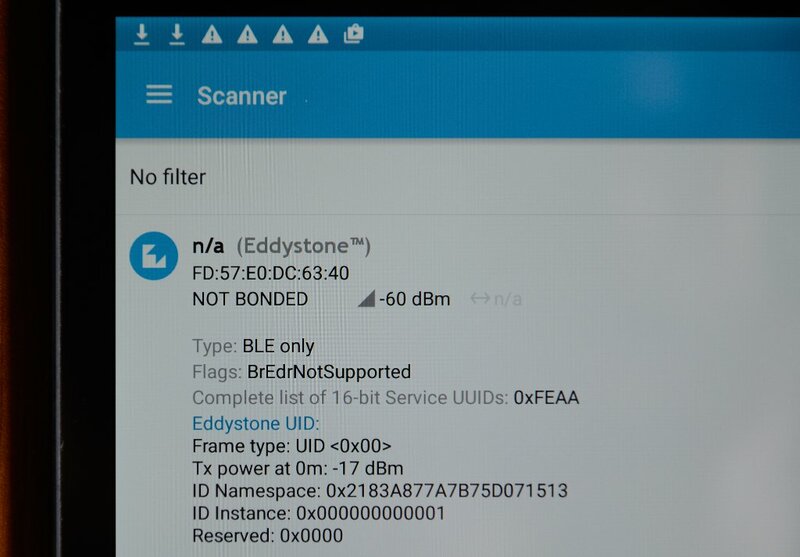 Finally, here are some screenshots from Google’s Eddystone Validator and Nordic’s nRF Master Control Panel showing the content of the Eddystone frames broadcasted by a Faros beacon. All further technical details can be found in the Faros GIT repository at GitHub. 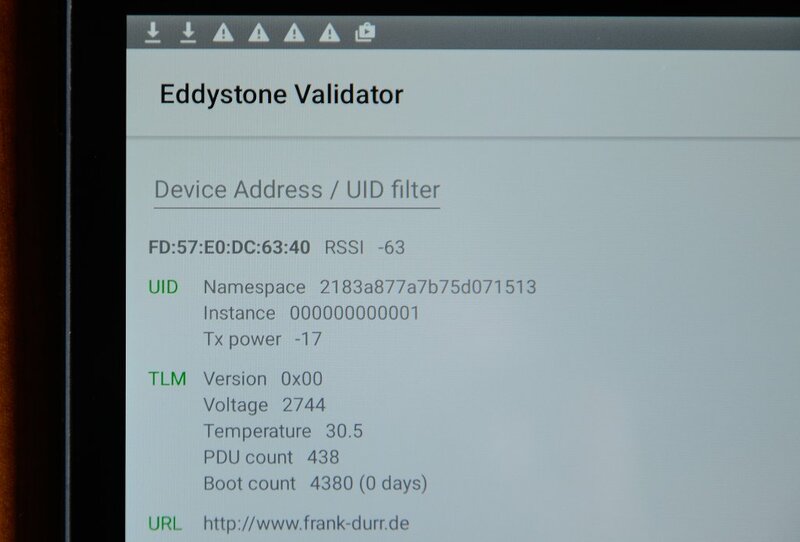 Have fun building your own Eddystone beacon with Faros!